First of all I would like to thank my dear friend Massimo Bettanin at global consultants ERM for urging me to read Paul Gilding’s “The Great Disruption”. His enthusiasm for the book put it at the top of my holiday reading this summer and, curiously, it was as satisfying to me as any holiday thriller. I make this comparison in order to deliberately highlight the unusually strong literary structure of The Great Disruption. In popular fiction (or many films for that matter) the plot follows a typical path. At first things start well but then our protagonist gets into some sort of trouble. Next they seem to be recovering the situation but they suffer another reverse. When things seem to have reached the lowest point, a glimmer of light appears, and our hero makes a critical choice which sets them on the path to resolution (after one or more further setbacks depending on the author’s taste for tension and the plot’s limits of credibility). Ultimately the actions of our hero results in a “happy ever after” ending. We remain attached to the characters because of their struggle to overcome their adversity. 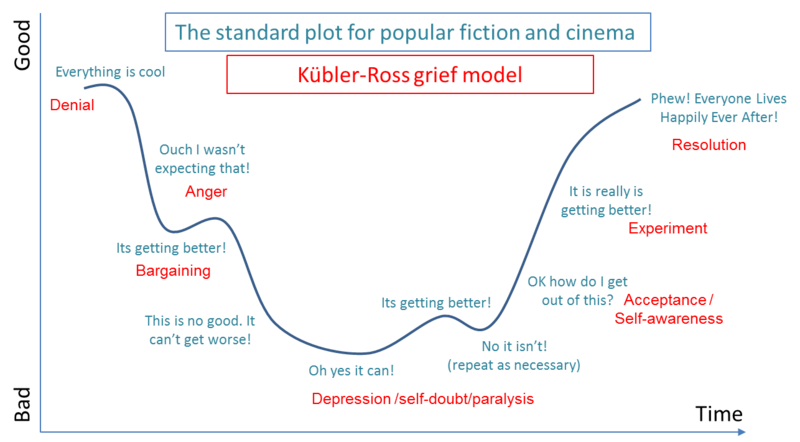 Thus in fiction and movies we are taken on an emotional roller-coaster which mirrors (albeit less intensely) the cycle of grief that Kübler-Ross famously documented. In “The Great Disruption”, unlike many other popular works on climate change, we follow a similar journey. The roller coaster starts to descent rapidly in Chapter 2 when “The Scream” reminds us that we have been in denial of the environmental harm we are causing for two generations now. We pick up even more downward speed in “A Very Big Problem” which rallies the latest grim science and the precautionary principle to spell out why we need to act. As if that was not enough, “Beyond The Limits” puts the boot in by telling us that The Great Disruption to our societies from climate change is scientifically and economically inevitable. This is followed by an exposition of the absurdity of infinite exponential growth and a worrying data that indicates that the inescapable end of growth may already have occurred (in 2008 perhaps). By this point we are well and truly at the nadir, the bad news is overwhelming and Paul Gilding cheerfully recollects the advice a doctor friend gives to terminally-ill patients “when things start changing for the worse, expect these changes to accelerate”. “First we have to accept that things are going to get ugly and prepare ourselves for this. Second we must drop the dominant assumption…. of how change will occur…. [It will be] discontinuous, chaotic and transformational driven by a war-footing type response. Third we must now understand that the type of change we need will require a major evolution in human values, politics and personal expectations. With this acceptance we can begin our trajectory upwards. “When the Dam of Denial Bursts” gives us an insight to the dramatic shift in economics, production, politics and attitudes that will occur when a sufficient number of us really believe in the inevitability of change. “The One-Degree-War” tells us that the emissions reductions will be deeper than previously imagined and will involve a mobilisation akin to the Second World War where humanity will do “what is necessary” to abruptly reduce emissions by 50% in five years, followed by a further 15 year’s trajectory to net zero emissions. The changes needed in those first five years are spelt out in detail: we will eliminate all waste; cut deforestation by 50%; close the 1,000 most polluting coal plants; launch a huge energy efficiency effort and back this up by rationing electricity; we will add carbon capture and storage to another 1,000 coal plants; we will create huge quantities of wind and solar generation; ration transportation to 50% of current levels including grounding half the world’s aircraft; use cellulose-based biofuels in combination with CCS to extract CO2 from the atmosphere; we will capture methane from land use and move away from animal-protein based diets; plant trees to extract 1Gt of CO2 from the atmosphere; and, finally, transform our attitudes to consumption. The scale of the response required is simply stunning. But whereas fear induces paralysis, Paul Gilding is adamant that “we can actually fix this”. We are reminded that human beings are great at dealing with crises and we have overcome similar emergencies in the past. While the laws of physics tells us our economic model is close to collapse, this does not mean that we are doomed. In fact quite opposite, the severity of the threat and the nature of our humanity will make a response inevitable. The chapters that follow provide a detailed exposition of the effort that we will muster, traversing topics as diverse as economics, geopolitics, consumerism, happiness and equality. The book closes with a reminder that it is we – all of us individually and collectively – who are in charge of our destiny and the underlying truth that it is the politicians, markets and corporations who march to our drumbeat not we to theirs. By its nature this book makes for uncomfortable reading. The copious references and supporting evidence lend the stark conclusions credibility. Paul Gilding’s biography as a former global CEO of Greenpeace and long-time campaigner for environmental issues tells us that this is no “Johnny-come-latterly, bandwagon-jumping, tub-thumping, rabble-rousing, my-picture-of-doom-is-worse-than-yours” exploitative title, but rather a product of decades of activism and thought. One of its strengths is that it is most definitely not a green polemic and will not only make uncomfortable reading for those in denial of climate change, but also for the “deep greens” who, correctly, place the blame for much of the crisis at the feet of corporations but at the same time deny that corporations have anything to do with the solution. For Paul Gilding markets and businesses are powerful forces for good – shock troops on the front line of the One-Degree-War. It is not that we need to change our organisations, he argues, but the people, values and design of the system. The writing style is easy and flowing. Looking at my own copy of the book I can see that there is hardly a page without one or more passages underlined in pencil, not so much because of the newness of the ideas, but because of the economy, clarity and elegance in which they are explained. I do not know whether the narrative structure was intended to follow that of popular fiction or whether it was a happy accident – but either way this leads to a much more readable book than many of its peers popularising the danger of climate change. Paul Gilding is presenting us with a plausible scenario for the future. We may individually disagree with some of his predictions but they certainly force us to think. If there is one message, however, that we should all agree on is that maintaining the status quo is quite simply impossible. From the acceptance of this simple truth we are all compelled to confront what our own vision of the future is and our own personal responsibility to make change happen. Ultimately the triumph of this book is its optimism. Dostoyevsky said “to live without hope is to cease to live” and “The Great Disruption” communicates, at its core, that our actions can make a difference. An effective response will inevitably arise because humans are intrinsically good, capable and inventive. It is a book written by a thorough optimists, like myself, and so I was enthused, albeit also challenged, by its message. In Paul Gilding’s vision we will, in the end, all “live happily ever after” in a world transformed for the better by the One-Degree-War. Paul Gildings has an excellent blog: “The Cokatoo Chronicles“. A compelling narrative about the inevitability of change and the consequences that will flow. There is, as would be expected for such a populist title, little in terms of the change needed an organisational level. Key messages are applicable to all organisations, although one may differ on the detail. Very well written, with an unusually strong narrative structure. Exceptionally it has something to offer for all readers, from those with no prior knowledge of climate change issues through to veterans. Good references. A powerful book which should be in the library of every environmental practitioner - if only to remind us of our purpose and inspire us to do better. KEY: Usefulness: how will this book support a resource efficiency practitioner? Does the book give real-world examples and tools? Are reference to other sources of information well documented. Is it an objective and credible source? Relevance: how widely applicable is this book in delivering practical resource efficiency? Is it only for a narrow niche or are the concepts widely applicable? Are there good, contemporary examples of best practice? Accessibility: how well written and structured is the book? Is there an assumption about prior knowledge? Value for money: Taking into account the other parameters is this book a good investment? Overall: The average of the previous ratings. IMHO= in my humble opinion. Please post a response to the review if you feel I have got this wrong!